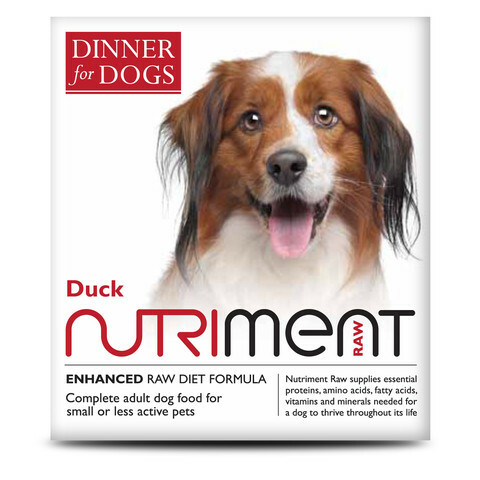 The Nutriment Dinner for Dogs Duck Formula RAW Frozen Adult Dog Food is available in 200g trays. Nutriment RAW Frozen Dinner for Dogs Duck Formula provides essential proteins, amino acids, fatty acids, vitamins and minerals need for your dog to thrive throughout its life and is ideally suited for small breeds or less active dogs. Nutriment RAW Frozen Dinner for Dogs Duck Formula is made with 75% meat and bone, and 25% vegetables, fruits and natural super foods. British Duck with Bone, Fresh Pumpkin, Fresh Broccoli, Fresh Green Curly Kale, Organic Coconut Oil, Raw Sea Kelp Powder (Laminaria japonica), Flaxseed Oil. Moisture 69.38%, Protein 13.20%, Fat 11.45%, Ash (inorganic matter) 3.8%, Fibre 0.5%.